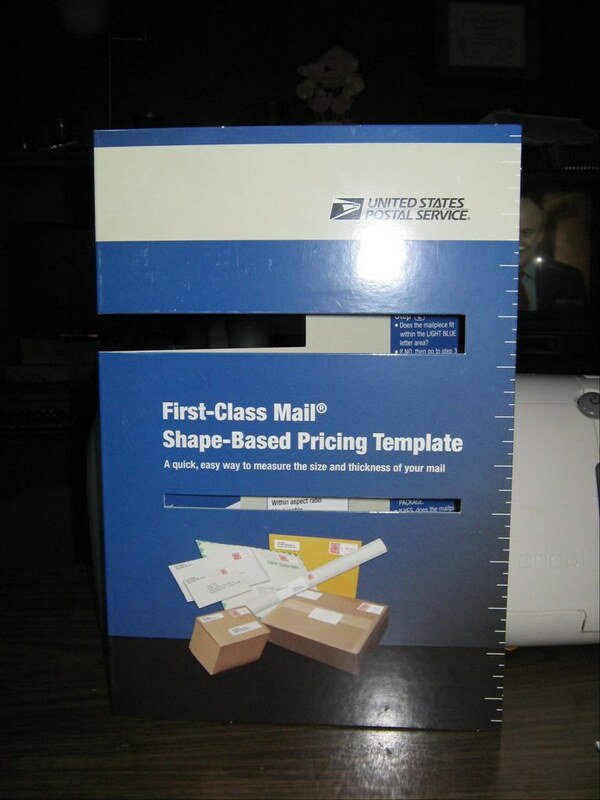 I got this handy dandy mailing template at my Post Office. I was asking on e of the clerks about envie size and such and he handed me this to take home with me. I use it often! He didn't charge me for it so I would assume you can ask for one free of charge. 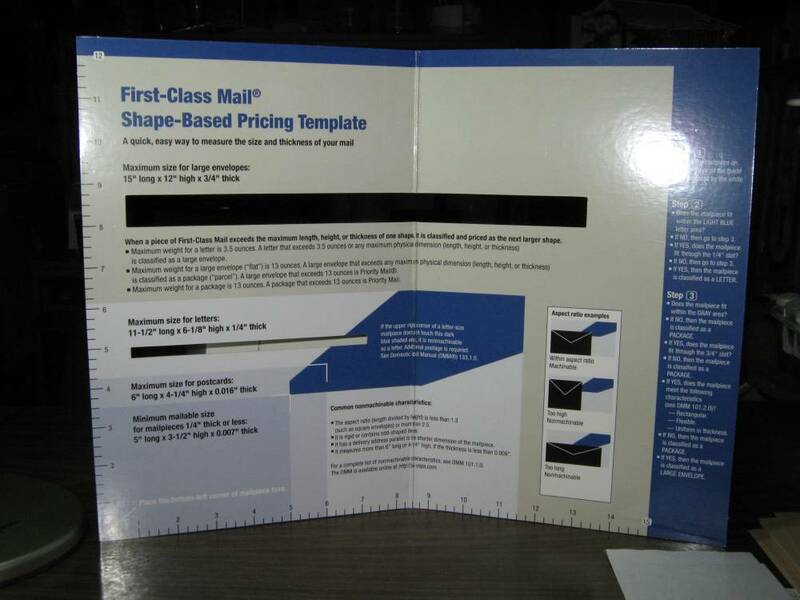 This picture shows the inside that has useful information about sizes and such. Notice the slots. 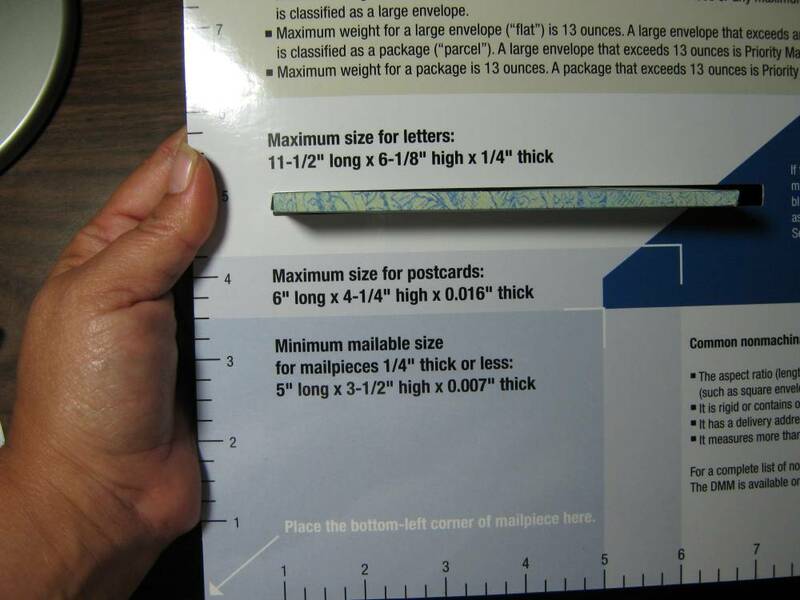 The large slot is for measuring depth of larger envelopes and the smaller slot is for smaller envelopes. There are a few useful guides on the template, and some useful information. Here is a picture of the square envie I made showing how the envie fits through the small slot. You can not force the envie it has to fall through on it's own. If it doesn't, then get ready to pay extra postage. While it did fall through easily right now it probably won't after I stick it another envie for mailing. HEhee- that looks familiar!! (I am a clerk at the local po) I use it daily!! : ) Well, I really messed the whole award thing up-after all those comments I still failed to tell you that your award was on my site-and I was told you copy it over to yours and then pass it on by mentioning 6 people to pass it on to-then leave comments on their blog to acknowledge. (Just don't forget to tell them where their award is after telling them your giving them one!! )oh boy- good thing it is the end of this day-tomorrow can only be better! O wow that is neat.. I am going to see can I get one of those..Thank U I had no idea i thought they just weighed them.. Thanks Okie. OOO I loved the scallops they did Perfect and the rectangles I have not done the others yet but I know they will be too!! Thank U!!! I tried to get one at my local p.o. but they told me they aren't for customers :( Thank you for sharing this idea. Well they are full of it Neesey! AshleeM just told me she got one from her PO! heck mine even just gave it to me when I asked about weights and sizes! Wonder why they said it wasn't for customers.....that is weird!